Abdollahi, A., Nozarian, Z. (2016). Diagnostic Value of Measurement Specific Gravity by Refractometric and Dipstick Method in Differentiation between Transudate and Exudate in Pleural and Peritoneal Fluid. Iranian Journal of Pathology, 11(4), 363-369. Alireza Abdollahi; Zoreh Nozarian. "Diagnostic Value of Measurement Specific Gravity by Refractometric and Dipstick Method in Differentiation between Transudate and Exudate in Pleural and Peritoneal Fluid". 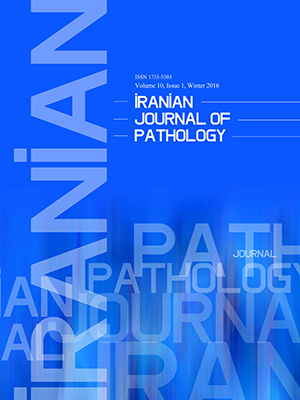 Iranian Journal of Pathology, 11, 4, 2016, 363-369. Abdollahi, A., Nozarian, Z. (2016). 'Diagnostic Value of Measurement Specific Gravity by Refractometric and Dipstick Method in Differentiation between Transudate and Exudate in Pleural and Peritoneal Fluid', Iranian Journal of Pathology, 11(4), pp. 363-369. Abdollahi, A., Nozarian, Z. Diagnostic Value of Measurement Specific Gravity by Refractometric and Dipstick Method in Differentiation between Transudate and Exudate in Pleural and Peritoneal Fluid. Iranian Journal of Pathology, 2016; 11(4): 363-369. Background: Accumulation of pleural and peritoneal fluid is seen in some diseases. In order to diagnose the disease and start the treatment, one of the most important actions will be to differentiate between exudates and transudates. The objective of this study was to determine the diagnostic value of measuring the specific gravity of the fluid through refractometer and strip in differentiation of exudates from transudates. Methods: The serum of patients was evaluated for protein, LDH, cholesterol, bilirubin and albumin. The fluid was evaluated for the number of white blood cells, protein, LDH, cholesterol, bilirubin and albumin. Then the fluids were divided into exduate and transudate categories based on Light and Gradient criteria. Finally, the specific gravity of the fluids was measured by refractometer, Erma, Japan and Medi-Test Combi II. The categorized fluids were compared with Gold Standards (final diagnosis) so that the sensitivity and specificity of Light and Gradient criteria in the transudate-exudate differentiation were specified. Results: In comparison with Light criteria, the cut off level of 1022 specific gravity measured by refractometer for pleural effusion has sensitivity, specificity of 92.1%, 68.1%respectively. In evaluation of peritoneal fluid considering cut off point 1023, measured by refractometer has reliable sensitivity 92.4%, specificity 70.4 compared with standard gradient method. Conclusion: Differentiating transudate from exudates by measuring its special gravity by refractometer will have acceptable sensitivity and specificity, and when rapidity is necessary or access to lab equipment is limited, this method could be used. Yilmaz A, Tunaboyu IK, Akkaya E, Bayramgürler B. A comparative analysis of the biochemical parameters used to distinguish between pleural exudates and transudates. Respirology 2000;5(4):363-7. Burgess LJ, Maritz FJ, Taljaard JJ. Comparative analysis of the biochemical parameters used to distinguish between pleural transudates and exudates. Chest 1995; 107(6):1604-9. Jiménez Castro D, Díaz Nuevo G, Pérez-Rodríguez E. Comparative analysis of Light's criteria and other biochemical parameters to distinguish exudates from transudates. Rev Clin Esp 2002; 202(1):3-6. Cullu N, Kalemci S, Karakaş O, Eser I, Yalçın F, Boyacı FN et al. Efficacy of CT in diagnosis of transudates and exudates in patients with pleural effusion. Diagn Interv Radiol 2014;20(2):116-20. Khow-Ean N, Booraphun S, Aekphachaisawat N, Sawanyawisuth K. Adenosine deaminase activity level as a tool for diagnosing tuberculous pleural effusion. Southeast Asian J Trop Med Public Health 2013 4;44(4):655-9. Kummerfeldt CE, Chiuzan CC, Huggins JT, Divietro ML, Nestor JE, Sahn SA,et al. Improving the predictive accuracy of identifying exudative effusions. Chest 2014 1;145(3):586-92. Patel AK, Choudhury S. Combined pleural fluid cholesterol and total protein in differentiation of exudates and transudates. Indian J Chest Dis Allied Sci 2013; 55(1):21-3. Porcel JM. Identifying transudates misclassified by Light's criteria. Curr Opin Pulm Med 2013; 19(4):362-7. Porcel JM. Pleural fluid biomarkers: beyond the Light's criteria. Clin Chest Med 2013; 34(1):27-37. Light RW. The Light's criteria: the beginning and why they are useful 40 years later. Clin Chest Med 2013; 34(1):21-6. Hamal AB, Yogi KN, Bam N, Das SK, Karn R. Pleural fluid cholesterol in differentiating exudative and transudative pleural effusion. Pulm Med. 2013; 2013:135036. Tavana S, Tavakoli H, Hashemzadeh M, Nadi E.specific Gravity of Pleural Fluid Determined by Refractometer to discriminate exudates and transudates. Res J Med Sci 2009;3(3):91-4. Costa MT, Quiroga E Cruz. Measurement of pleural fluid cholesterol and lactate dehydrogenase. A simple and accurate set of indicators for separating exudates from transudates. Chest 1995; 108: 1260-3. Garcia-Pachon E, Padilla-Navas I, Sanchez JF. Pleural fluid to serum cholinesterase ratio for the separation of transudates and exudates. Chest 1996; 110: 97-101. Gonlugur U, Gonlugur TE. The distinction between transudates and exudates. J Biomed Sci 2005; 12: 985-90. Gottschalk A, Stein PD, Sotsman HD, Matta F, Beemath A. Very low probability interpretation of V/Q lung scans in combination with low probability objective clinical assessment reliably excludes pulmonary embolism: Data from PIOPED II. J Nucl Med 2007; 48: 1411-5. Heffner JE, Sahn SA, Brown LK. Multilevel likelihood ratios for identifying exudative pleural effusions. Chest 2002; 121: 1916-20. Light RW. Falsely high refractometric readings for the specific gravity of pleural fluid. Chest 1979; 76: 300-1. Papageorgiou E, Kostikas K, Kiropoulos T. Increased oxidative stress in exudative pleural effusions: A new marker for the differentiation between exudates and transudates?. Chest 2005; 128(5):3291-7. Yetkin O, Tek I, Kaya A. A simple laboratory measurement for discrimination of transudative and exudative pleural effusion: Pleural viscosity. Respiratory Med 2006; 100: 1286-90. Zocchi L. Physiology and pathophysiology of pleural fluid turnover. Eur Respiratory J 2002; 20: 1545-58.